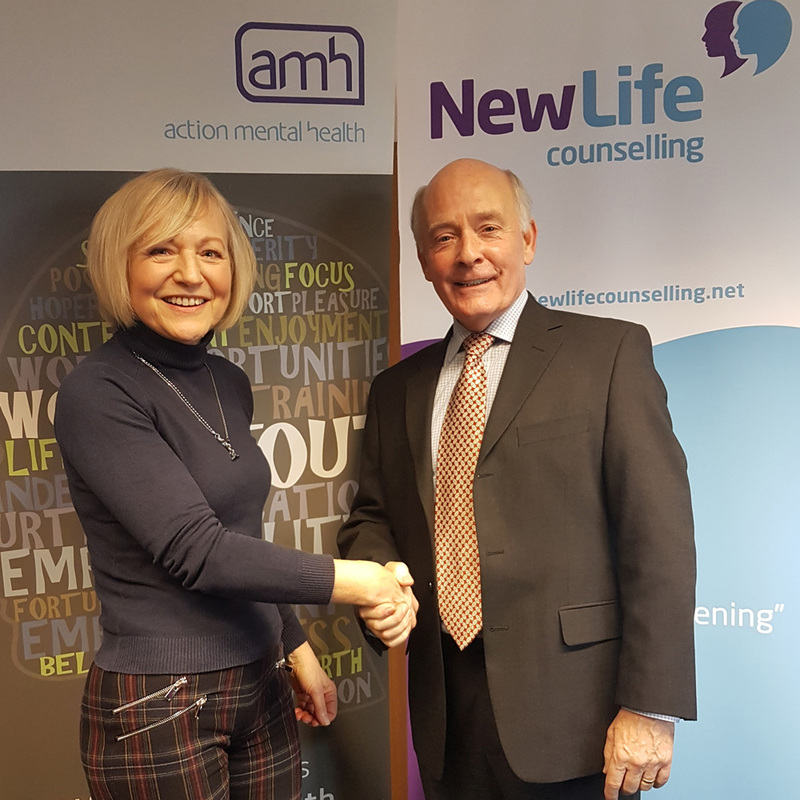 Vice Chair of New Life Counselling, Gabi Mornhinweg and Action Mental Health’s Chairman, Peter Fitzsimmons shake on the new relationship between the two organisations. Action Mental Health and New Life Counselling have announced an exciting new partnership. From 1st April 2018, the two local charities have created a new Group Structure which will see the two well-known local organisations come together to provide a more integrated service for communities throughout Northern Ireland. Both organisations have a history of working through partnerships to deliver better outcomes for their clients and this initiative builds on that experience and expertise within both charities. The purpose of this initiative is to enhance effectiveness in meeting the needs of service users, clients and communities and ensure resources are focused to best effect so that they improve the long-term sustainability of both organisations and their services. Under the agreement, New Life Counselling will become a subsidiary of Action Mental Health but it will continue to be a separate charitable company with its own name, board, contracts and employees. The organisations will be actively engaged in a working process over the coming months and the existing Joint Working Group, made up of Board members from both organisations, will continue to lead and support the process of aligning the two organisations. Both organisations rely heavily on the support and encouragement of all their stakeholders and as such will provide regular updates on any further developments.